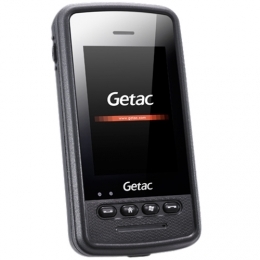 When you buy a Getac MH132, you get a multi-functional outdoor smartphone in pocket format, which is lightweight, yet extremely robust and always at your service. Whether on the construction site, in production, logistics or field service, the MH132 is at home where other devices do not even dare to go It is operated via an intuitive touch screen 8.2 cm / 3.2 LCD or its four function keys. High speed, performance and compatibility with existing systems are ensured by the high-performance 600 MHz processor and Windows Mobile 6.5 Professional standard. For data transfer, you have many choices micro USB interface, wireless connection such as 3.75G, WWAN, Wi-Fi, GPS and UMTS. With the micro SD card slot, you can expand your memory up to 32 GB, which is very useful when taking and saving pictures with its integrated 3.2 megapixel camera. No matter the challenge, long battery operation time and diverse accessories give you the necessary security and expand your applications many times over.